I hope everyone had a very pleasant Christmas. Mine was great, much better than last year when I had just left my home and marriage of forty years only a week before Christmas. One son remarked that it was good to see me smiling this Christmas, he hadn't seen much of that last year. We had a pleasant family time at my brother's and the young children all had a wonderful time in the pool after lunch. I went to church with my son and Dil in the morning, to the church they attend weekly. I know many of the people there and the service was really lovely, one of the best Christmas services I've been to in a long time. I usually attend a different church in the city but went with them for a change. It was good to go by car too, as I normally catch the train to city. LOL. 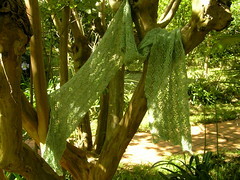 Here's another lacy scarf for Bell's Long Lacy Summer. This one is done in Heirloom Cashmino and was quite a quick knit. The cashmino is a blend of merino, cashmere and a bit of microfibre. The pattern is on the Knitpicks site and is called Victorian Spring Lace. While it did not say so, I knitted the scarf in two pieces and grafted them together. This gave me a good scalloped end at both beginning and end. The graft can be seen in the photos as a diamond with a yarnover in the middle. Grafting something with a directional motif like this arrowhead also ensures that the arrowhead goes in the same direction on both sides when worn, in this case, up to middle of neck. The yarn was pleasant to work with, easy to handle and knit with. No splits when knitting either. and the colour appealed to me. I gave it a fairly severe blocking yesterday to open it up. There are only twenty one stitches/row and eight rows/pattern repeat. I gave the pink scarf pictured below to DiL's mum s a present. She sews and can knit but hasn't for very many years. She was intrigued by the lace on the blue scarf where "every stitch is part of the pattern," as she put it. She really liked the pink one. I offered to dye it, but she said the colour was lovely, so that's one task saved. We're having a quiet week at home here. Son and DIL and her mum are playing World of Warcraft, and I'm knitting, eating too much chocolate and gearing up for some sewing. I've been feeling like making something for a while, but it's been some time since I sewed anything. I bought Amy Butler's In Stitches from the Book Depository a few days before Christmas. It took only five days to arrive, even in that busy period and cost me $24 Australian which I thought was a good price. I couldn't find it here in any online catalogues but I'm sure it would have been much dearer and postage is free from England. I was surprised a couple of weeks ago to find just how much I had saved by buying a children's knitting book, shown a few post below, from that Depository. I paid somewhere around $14-15 Australian. 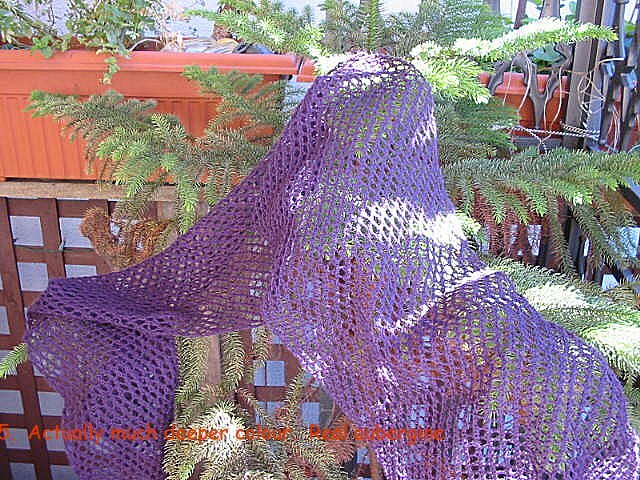 I saw it advertised in an online Aussie knitting shop. It was $26. Now, I've bought from that shop and the stuff is lovely. However, They charged me a mint to send a small package across the country. While I like what they sell, I now look for some online shop in Australia which has a policy something like "$7 postage in Australia." Or similar. So why the urge to sew? I've seen several blogs mentioning the long legged lounge pants in Amy Butler's book. I'd been planning on trying something like that using some pyjama pants as a pattern. Now I have a pattern. DIL was looking at the book after lunch yesterday and said how much she like the long pants too. So it looks like some coming up for her too. Perhaps some sheeting which would be cool and comfortable. Here's the pink scarf finished. It's not blocked yet, but that can wait a few days. I decided as I was coming down the home straight with it, that I would give it to DIL's mum. She'll be here several days over Christmas. I don't like the colour myself, but she may. I'll ask DIL before I trouble myself dyeing it. The grafting of the two pieces took me ages. I don't mind doing kitchener graft and there were only thirty three stitches, but it seemed to take forever. Fortunately I did not darn the end in immediately after finishing the graft as I really needed to ease my fingers across the scarf and loosen it up just a bit. Otherwise I was pleased with the graft. Toes on socks are one thing, but joins on scarves are another altogether. The wool is 100% pure wool, 2 ply laceweight from Bendigo. I bought it to try something else out and it came from my stash. I have other better quality laceweight in the stash. I really don't like the colour. On upending the cone, I discovered it was called "musk." Hmmm. I never liked musk sticks as a child and still don't. I wonder if that dislike affected my reaction to the colour? That now makes two lacy scarves for Bells' Long Lacy Summer. Looking back, I really wonder what bothered me about laceweight. I did make quite a large stole in laceweight cashmere for a friend's birthday a few years ago. The pattern was very repetitive but the cashmere was expensive and very fine and soft. As the picture from my original blog shows, it was quite large. Not a difficult pattern at all but I had to pay attention to which row I was on. I might make another scarf soon, but will consider what to do. So many lovely patterns. I think my arthritic fingers need a break from the fine yarn. I usually have several different weights of wool on the go at once. I've been concentrating on the fine stuff for a while, so may do something thicker. Here are two pictures of the scarf on one of my DIL's ladies taken in our upstairs hallway. She has about six of these, bought from Reverse Garbage at various times. There's a dressmaker's dummy, several shop figures. I think this would have been in a shop and she has another in woven raffia. The second picture is probably a more accurate colour and was taken using the flash. Just think musk stick. Blocking in a few days, I think. I think Bells must be an enabler. I've started another lacy scarf, leaving aside my beloved socks and the two jumpers already on the needles. Not only that, but last night I found myself deliberately seeking out laceweight yarn on the net. I doubt I would have bought any as I have several lots and a little goes a long way, but I was definitely looking. I was even considering better needles as my Knitpicks options already have something on them in the size I want to use. This is Bendigo laceweight, bought because of both its yardage and price when I was considerng a mystery shawl KAL. I had already done a similar shawl some years ago in thicker wool. However, this KAL fell apart before it even started. I don't mind the wool but found myself yearning for some merino/silk mix from several vendors. Some of the colours were absolutely luscious. Bendigo's laceweight came in some decidedly uninteresting colours and I will almost certainly overdye this scarf when it's finished. I'm considering several colours but haven't yet made up my mind. I don't have the pattern with me at the moment, but this comes from the Inside Loop. It's called something like the Wild Strawberry scarf and comes from their archives. The pattern includes a larger wrap which is similar to the scarf but which has an extra panel with points on each side. They have some rather nice designs and I've made a couple of them. In this issue, I particularly like the man's jumper with the celtic knot and the braid on the sleeves. They also have jumpers in larger sizes which suit me as I'm, let's call it, "well endowed" and often don't like jumpers which are really designed for women with a smaller bust and then just upsized to make a range of sizes. Just as well I don't mind grafting, although I will brush up on it again soon. The picture shows just over a half of the first section of scarf. Another half is then knit and the two are grafted to preserve the scallop edge. Obviously, blocking will make this look better. The colour is pink, very pink. This photo was taken early this morning as I tried to make amends for no knitting for three days. I think it's picked up some of the deep violet of my Advent candles. * I had a very hectic few days and really did not want to carry around a cone of wool with me. I try to do several repeats a day. It's only ten lines and is easy. Much better than the boring single line pattern of the green scarf below. There are YOs and purl 2 together on every back row, but they occur in the same place each time, four times/row and are easy to do. * Here's a very brief explanation of the tradition of Advent candles. Advent is the season in the church calendar of the four weeks before Christmas and Advent candles are becoming popular again with individuals and families. The violet is for the first two and the last Sunday and signifies repentance. The pink candle is lit on the third Sunday as a sign of rejoicing that an end to the penitential time is near. The extra white candle stands for the coming (advent, advenio, I arrive, Latin) of Christ. Over 200 pins later, I've finished and blocked the scarf. It's hanging here from the crepe myrtle in side front yard. I'm pleased with it but found it a boring knit. Really only one pattern row which varied in its start to give the arrow head effect. It's made from sock wool, 448 metres, from Live 2 Knit. I really did this as an experiment in lace for Bell's Summer of Lace. I do lacy insertions etc and I've done a shawl which taught me a lot but really have not done much lace. I still find laceweight a bit intimidating and sock wool was a progress step to it. However, I have been eyeing off some lacier patterns. I still have a couple of other projects on the go, so will think about what's next. Click to enlarge photo to see detail. The colour was hard to capture. In some lights it's quite green. others show it as sort of washed out. I think this will be for me as it's very soft and squishy around my neck and is good and long so can be worn several ways. However, 200 pins later makes me see why regular lace knitters use blocking wires!